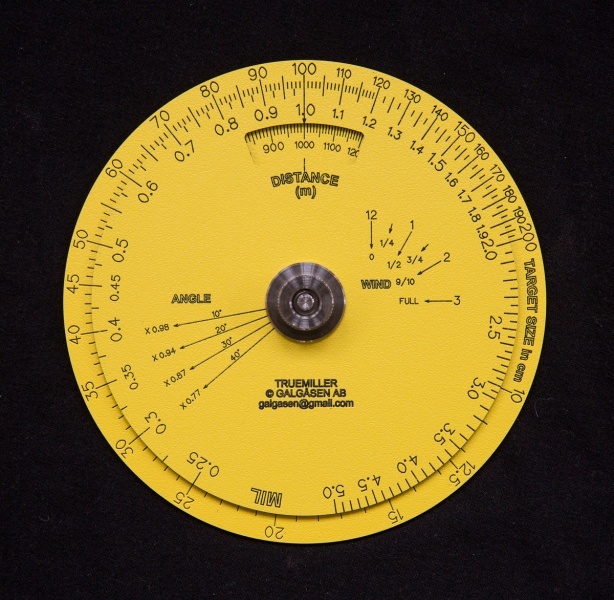 Circular slide rules are a powerful tool for routine repeat calculations. Looks fun. Like the gongs hung in the centre of car tyres, will make them easier to see even when the paint is shot off. 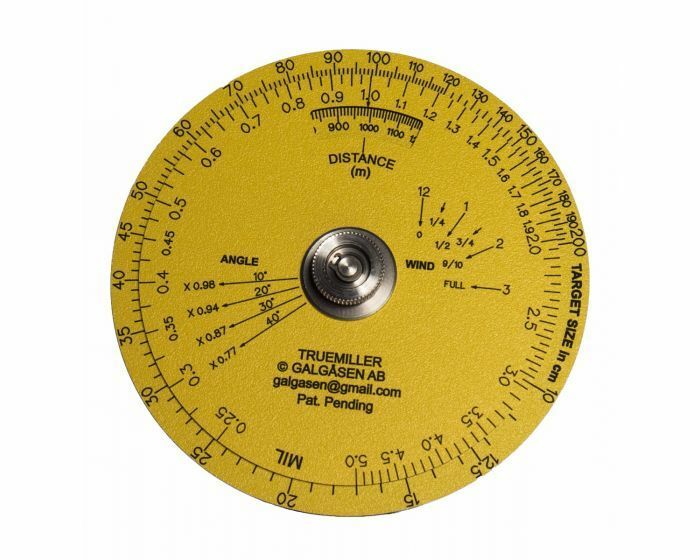 A link to the circular slide rule used. Start with finding your target size on the outer disc/scale labeled ¨Target size in cm¨. Measure the target with your scope and estimate how many MIL's it is. Turn the inner disc/scale labeled ¨MIL¨until your MIL value and target size are perfectly aligned and read the distance in the window ¨Distance¨. Example: We have a target size that is 75 cm and find it on the outer disc/scale. We estimate that the target is 1.4 MIL in our scope. Turn the inner disc/scale until 1.4 MIL is aligned with 75 cm and read in the window ¨Distance¨. It should say 535 m.
If the distance is known, you can easily calculate the target size by putting the correct distance in the window ¨Distance¨, then measure the MIL and see where it align on the outer disc/scale. Example: We know the distance is 800 m, set the window ¨Distance¨ on 800m. We estimate MIL to 1.5 MIL. 1.5 aligns perfectly on 120 cm on the outer ¨Target size¨scale. The locking screw in the middle allows for a fast lock of the discs so your values does not change accidentally. Wind: Simple guide for reading wind from different directions. A 5 m/s wind from 3 o'clock is fully compensated - i.e. 5 m/s - but if it comes from 1 o'clock you just take 1/2 value of 5 m/s = 2.5 m/s. Angle: Simple guide for shooting uphill or downhill. Shooting 30° downward you take your distance X 0.87. Designed and Manufactured by Galgäsen AB, Sweden. Better image of the calculator. Printable Russian Ballistic Calculator Slide Rule for .308 Win. Only a link as it is a larger image. Sorry, no time to transcribe the cyrilic. Now that just made me think my eyes were blurry! Thanks! Was on a tablet and unable to fix the link myself. Sounds interesting, what kind of tablets are you taking? I prefer Samsung E. It's THE tablet for an all night rave!